Today’s guest rocked our facebook community page with some amazing hand stitching and today, she is about to do it again! Hello! I’m Jessica from Twin Fibers. I’m a wife and stay-at-home mom to three kids. In my spare time I love to quilt, sew, crochet, knit and embroider. As my 12 year old daughter told me recently… she likes to keep her hands busy doing something creative. I’d have to agree, I do too. 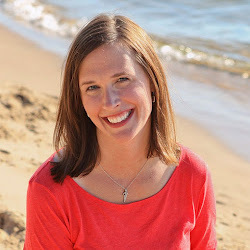 My twin sister and I started writing the Twin Fibers blog a few years ago as a way for us to share what sewing projects we were working on. It’s been a great way for us to stay motivated to finish the projects we start and has become a wonderful way for us to connect with others who enjoy the same hobbies. Use the flower shapes and leaves that you’ve cut out of wool felt and place them to the left side on one piece of background fabric (as pictured). I started with embroidering the leaves and pinned each of them in place so that they would stay put while working on a leaf. 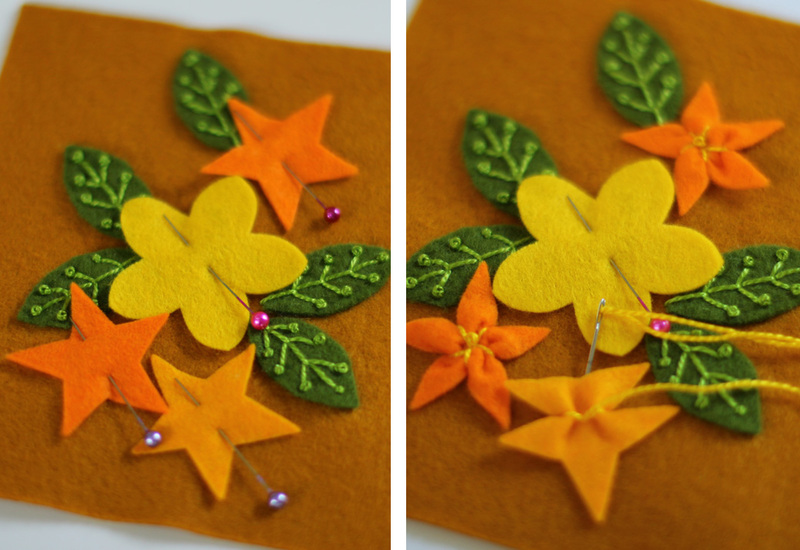 Embroider the vein pattern in each leaf with perle cotton and the crewel needle. 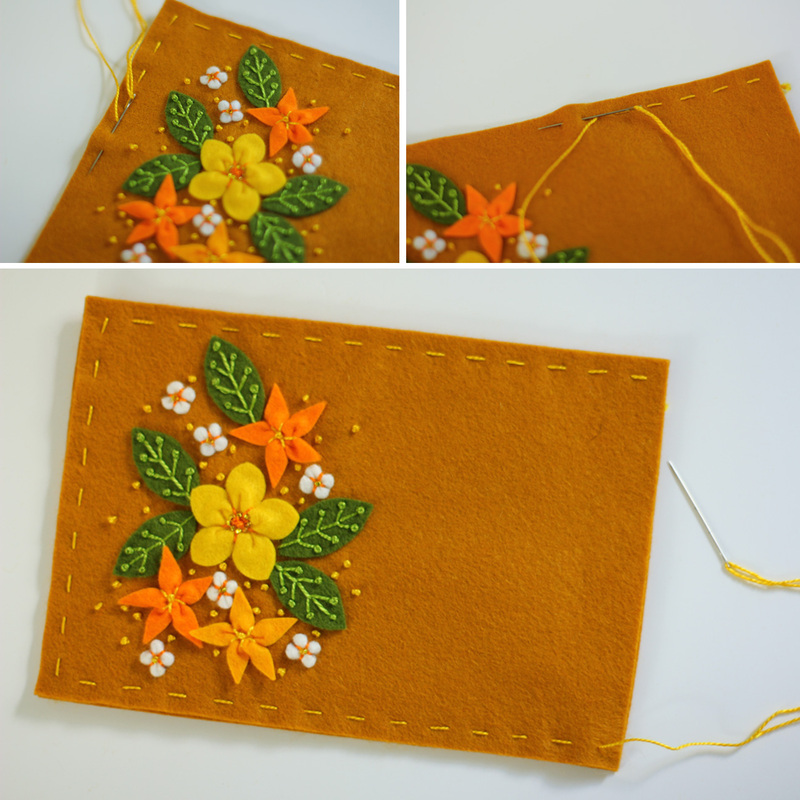 Add a french knots to the end of each vein. Next, I pinned the large center flower and star flowers in place. Attach each flower by coming up through the center of motif and crimping each petal by bringing yarn around the motif and stitching through the background close to the center. Repeat the step to crimp each petal of the flower and give it a 3-dimensional look. Embroider one french knot in the center of each star flower and three french knots in the center of the large flower. Now, add in the small circle flowers and stitch them on as you did the larger flowers, dividing each circle into four petals. Now, it’s time to add the seed beads. Using the beading needle and two strands of embroidery floss, stitch one seed bead to the center of each circle flower and about 8 beads around the three french knots of the large center flower. Use perle cotton and the crewel needle to embroider french knots scattered onto the background. The embroidery is finished, now you’ll need to sew the front and back together to make the pin cushion. Use perle cotton and make a running stitch (about 1/4″ stitch length) all around the outside about 1/4″ from the edge. Leave one side open to allow for stuffing. Lightly stuff the pin cushion and close up the open edge by continuing the running stitch. Now, go back around the pin cushion and wrap the perle cotton around each stitch three times to create a decorative edge. That’s it! Now you have a cute pin cushion to use while stitching up your next sewing project. I hope you’ve enjoyed seeing how to make this unique pin cushion! Please visit the Twin Fibers blog to see more of what I’ve been up to and the Twin Fiber etsy shop for a Flower Power Pin cushion kit of your own! 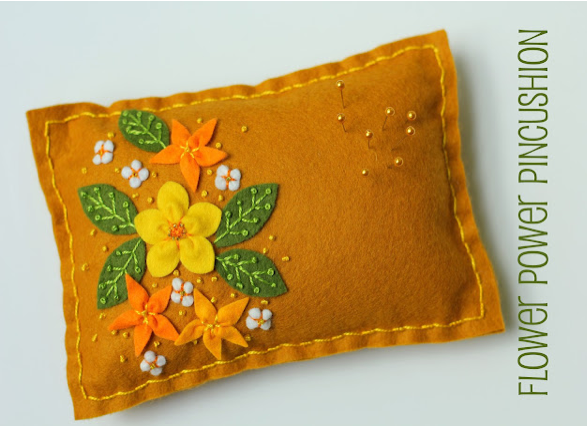 A big thank you to Jessica for sharing this pretty pin cushion! We all know how much I LOVE pin cushions and this one is so pretty that I might need to make one. But I need to find out more about these different types of needles. Maybe if we ask nicely, Jessica can come back and explain the difference between each needle. Stay Tuned- Tomorrow Gina from The Shabby Creek Cottage is stopping by tomorrow to share a fun project! This is quite lovely and your embellishments are fabulous . Thanks for sharing the how-to. Sooo cute! I will have to go out and get some materials post haste so I can make a few of my own! Thank you for sharing this tutorial. Christmas gifts for neighbors and others.